……….There is no menu here. You get served, what you deserve. I was a Property Guardian while living in Bath. Simply put, PG’s look after empty businesses, homes etc. The main aim, is to prevent squatters from moving in. We sign a letting agreement. Pay a licence fee. Agree to maintain an active presence. And keep the property clean. Ready for inspection at any time. Rent is dirt cheap. And in most cases includes all utilities. Two other guardians Carlos* and Rachel* (names have been changed), shared the premises. It wasn’t long before Carlos and I established a budding friendship. An unspoken agreement existed between us, to share cleaning duties. Rachel never lifted a finger to help. In any way. Not once in the 2.5 months we all lived together. She also took liberties. Using things which didn’t belong to her. Other incidents made it obvious Rachel didn’t care about anyone. Besides Rachel. One day, we discussed how best to approach the situation. Eventually ,we decided to pull the load ourselves. The conversation strayed to more serious offences. The Holocaust. Syria. Slavery. Endangered animals. Human trafficking. And other ills. We talked about Karma. I remember saying : “Everyone eventually gets their dues“. That night before bed, I made a mental note to blog about Karma. Click here for a good explanation of this law. We’ve all done things we’re not proud of. It’s a part of life. Experience. With great knowledge comes responsibility. Especially how we respond to and treat others. My hands are not clean. I have hurt others. Treated them unjustly. Turned my back. We all have. Trust me. The same things have happened to me. Even now, I sometimes speak too quickly. And react to situations without thinking. Massive work in progress. As I’ve lived. And learned. I realised a long time ago, the golden rule is golden. For a reason. Lets face it, people will hurt and disappoint us. And depending on the severity of the offence. There are stages through which we must all pass. Anger. Denial. Acceptance. Human nature ignites feelings of revenge. To give as good as we’ve gotten. Or even worse. A broken heart? Yep. Cheated on. Sure. Lied to. Been there. The coworker from hell. Check. A family member who turned their back on you. Sure. A gossip has ruined your reputation. Certainly. A romantic partner played you for a fool. Been there. Identity stolen? Done. A broken trust. You betcha. Someone’s actions caused the death of a family member. For sure. A child’s father is years behind in child support. Undoubtedly.The list is lengthy. Why do we wrong each other? The jury might still be out on this. Learned behavior (wonderful, life is easier). We are afraid to step outside the warm, and fluffy comfort zone. Basic human nature. Greater benefit to ourselves. Stupidity. No conscience. Doing wrong feels right. Old habits are hard to break. Carry on. A few years ago, I decided to let time take care of things. Meaning. Karma or justice eventually prevails. Carry on with life. The best revenge is living well. One day, all scores will be settled. Every misdeed. Ill will. Unjustifiable act. When it becomes necessary to set records straight. Clear up misunderstandings. Stand up for ourselves. Do it. I try to leave relationships with the other person feeling good about themselves. Even though they’ve done terrible things. This gives them an incentive to change. I firmly believe if we treat people how they can be. They will want to live up to expectations. Although change might be slow in coming. Forgiveness frees your soul. Not the offender’s. I haven’t done this with every relationship. I continue to try. It’s imperative we learn from the experience.When we are angry, it’s easier to strike out. Seek revenge. 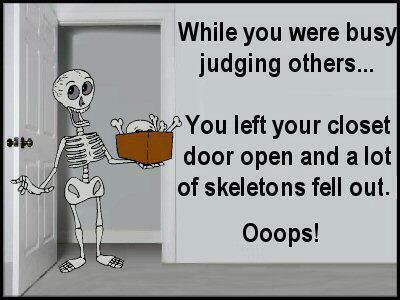 Especially if it seems Karma has missed this person on it’s list. Resist the urge. Please. Wish them well. And move on. Wayne Dyer has said : ” How people treat you is their karma; how you react is yours”. One final note, Carlos and I moved out on the same day. Rachel revealed to Carlos, her boyfriend had dumped her. And she feared she was about to be sacked. From her new job. Both happening within a week of each other. Whether or not this relates to our experience with her. Or something else entirely. Is anyone’s guess. It’s not for me to decide. Nor will I gloat in her misfortunes. The good. Or bad. You do. Comes back to you.